4 West Regent Street, Glasgow. G2 1RW.Tel: 01413321842. You can walk through this large establishment and end up in another pub in Renfield Street, the Renfield Arms. Owner Mr Daniel McAuley took it over a few years ago, his father Tony was a well known and respected publican in the Gorbals for many years, in the Pig & Whistle, McNeil Street off Ballater Street. 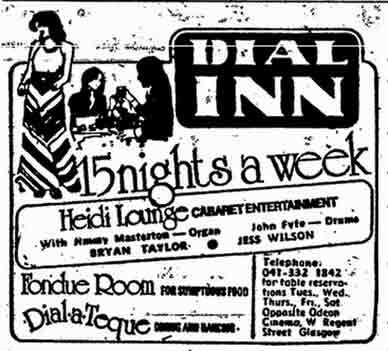 He also owned Tony's Bar in Old Dalmarnock Road now the Hayfield. In the 1980s this was known as the Dial Inn over the years it has had various names, Wyper's restaurant, Four a Snack Bar. A view of the main bar/restaurant area. 1950s. It was refurbished in 1952, when alterations were complete a new bar was installed running along the wall with a canopy above, small dining cubicles surrounded the room with tables and chairs taking up the rest of the floor space. In 1953 it was extended again this part was called the Four A Snack Bar with Victor Healy as catering manager. Interior view of Four A Snack Bar and Lounge. 1950s. In 1967 Douglas Scobie retired as manager of Wyper's, he served 52 years with the firm. When J & R Tennent Ltd took over in 1957 for £120,000 Mr Scobie agreed to continue as manager. Mr Scobie started with Wyper's when he was 15 years of age. 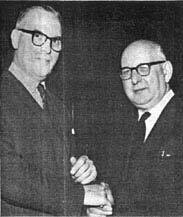 Mr Douglas Scobie on the right with Peter Scott sales director of Tennent Caledonian Breweries Ltd 1967. You can walk through Drummond's Bar and go right through to the Renfield Bar on Renfield Street. 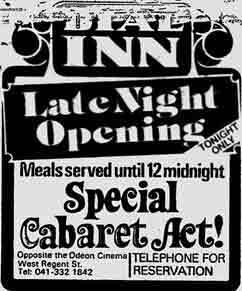 The Last place in Glasgow to open with a musical bang is the Dial Inn in West Regent Street. In the main lounge, which has an attractive Swiss-style decor, they are featuring two main acts a night, backing by resident duo Ken Flower on organ and Mike Scott on drums. Entertainment is featured from Tuesday until Saturday, and this week they have on Stage Phil Clark, jun., the impressionist, comedy vocalist who appeared fairly recently on Hughie Green's Opportunity Knocks' and Maggie Mercer. Maggie, of course, is very well-known in Glasgow and the West of Scotland as resident vocalist in the Bruce Hotel in East Kilbride. Maggie is married to band leader Jimmy Mann. Drummer, Mike Scott is a familiar name to Scottish theatergoers. He was musical director of the rock musical "Hair," which was such a big hit at the Metropole Theatre some time back. Next week the Dial Inn feature father and son act Bob and Bruce Adam, who were so popular with audiences in a couple of shows which they did at the Bazaar during the Clyde Fair Fortnight. Bob and Bruce have spent most of the year sunning themselves, and working in between times, on cruises in the Mediterranean. Another attraction at the Inn is their disco room with actor Tom Cotcher from Dundee Rep spinning the records. On every table they have a phone so that patrons can dial Tom and put in a request. It's a welcome addition to the Glasgow musical scene. 1973. 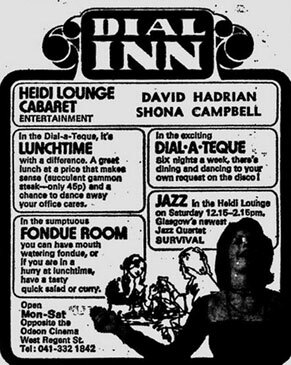 The Dial Inn, advert 1974. 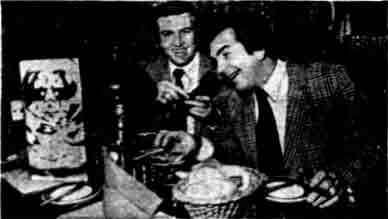 The Alexander Brother taste the buffet at the Dial Inn. 1977. Mr Victor Healy, catering manager of Wyper's. 1950's.